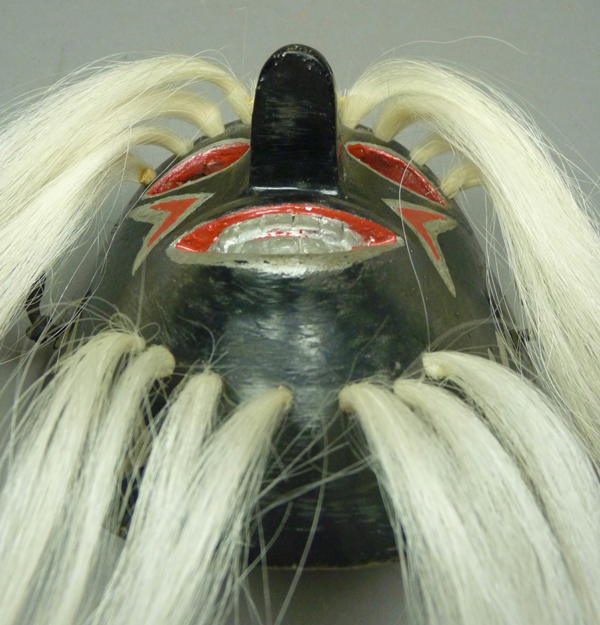 The tip of the nose is scuffed, and there are missing hair bundles. The simple forehead cross of four recessed triangles is surrounded by rays of light. 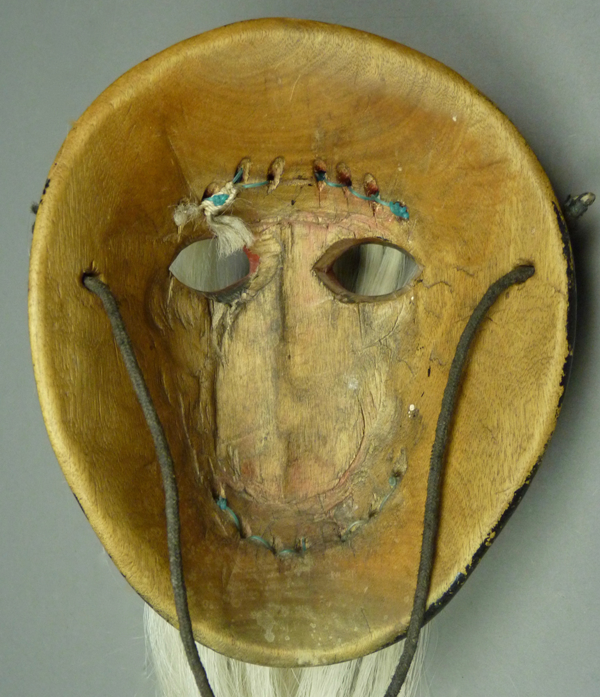 This mask is 7 inches tall, 5 inches wide, and 3 inches deep. 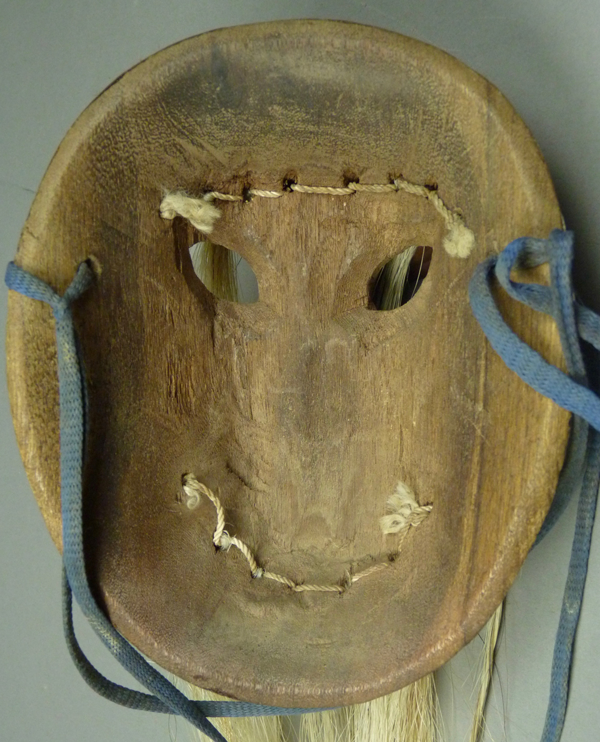 The second mask, which apparently dates to the 1990s, was also collected by Tom Kolaz in 2008, after about 10 years of use, and is another that I purchased in 2010. 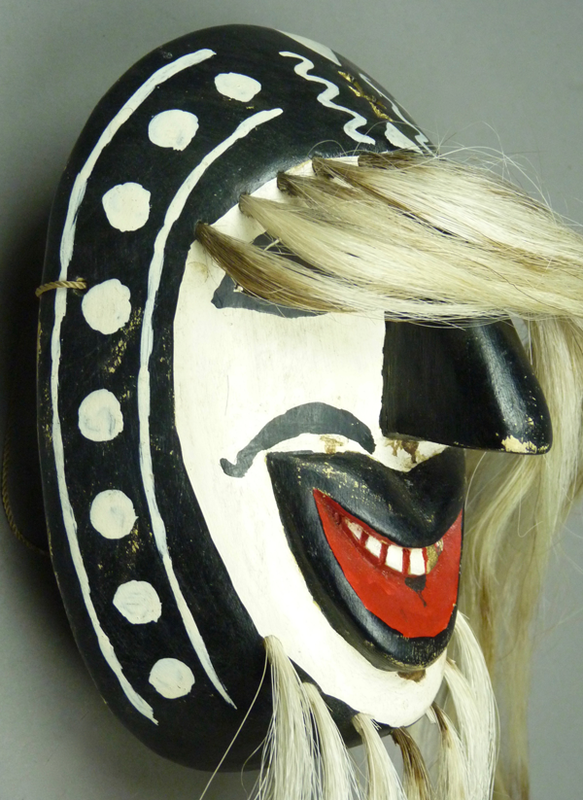 This mask is quite similar to the first, but it carries the longer Sinaloa style Mayo hair that has become popular with the Sonora Mayo dancers. 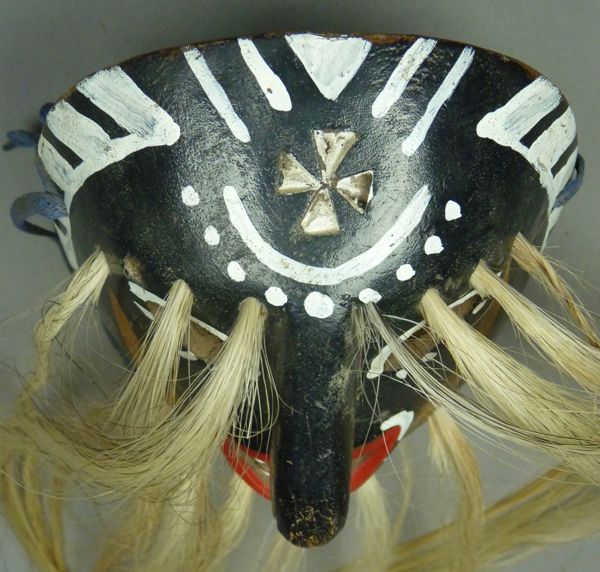 We find the same typical Francisco Gámez forehead cross, but along with some attractive design variations in the painting of the rim design and facial features. 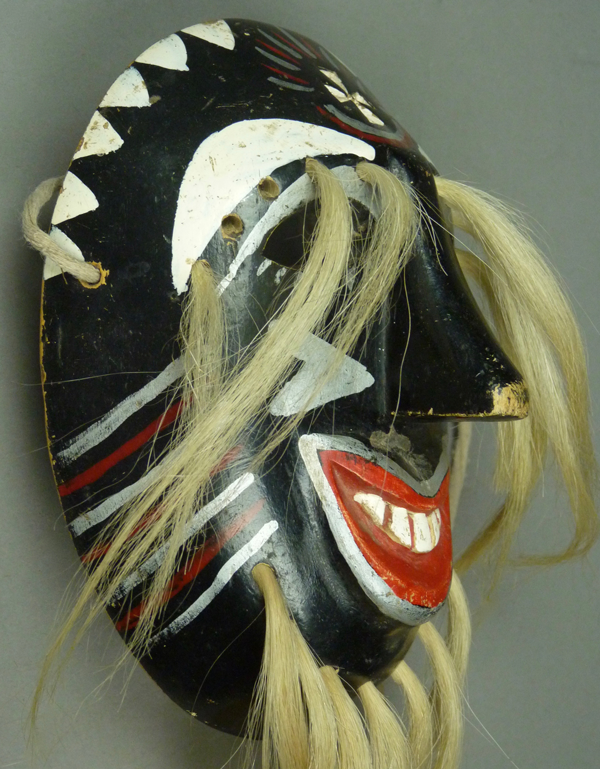 I particularly like this crescent of brown paint around the face. 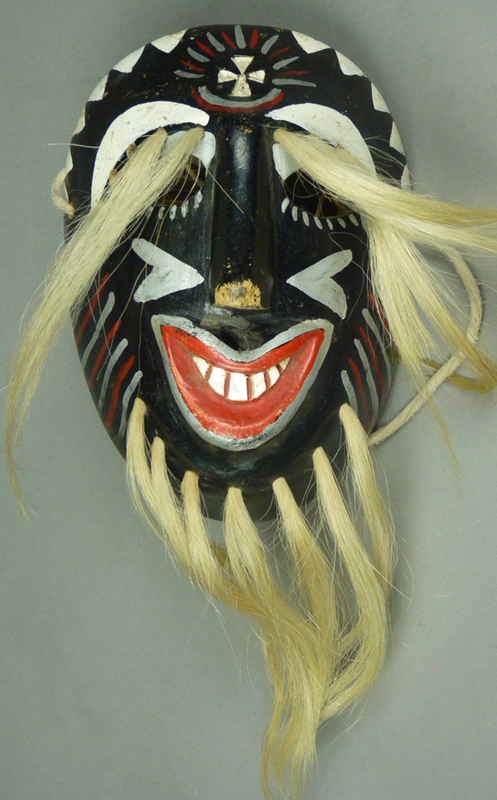 This mask is 7 inches tall, 5½ inches wide, and 3¼ inches deep. There is dark staining from use. 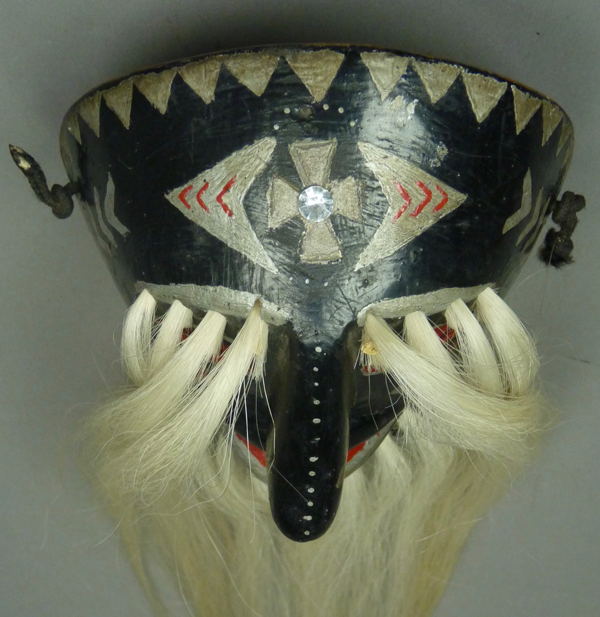 The third, which may portray an “Apache” or Plains Indian, was probably made in the 1980s or 90s, and I obtained it from Tom Kolaz in 2014. We see the hair becoming longer and longer. 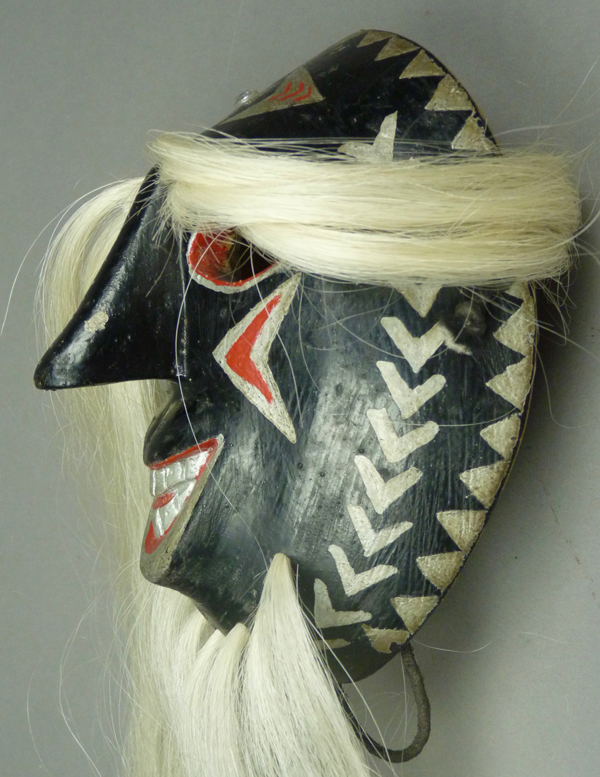 There is so much to like about the graceful carving and painting of this mask. Also look at the way that the grain of the wood has become visible under the paint. 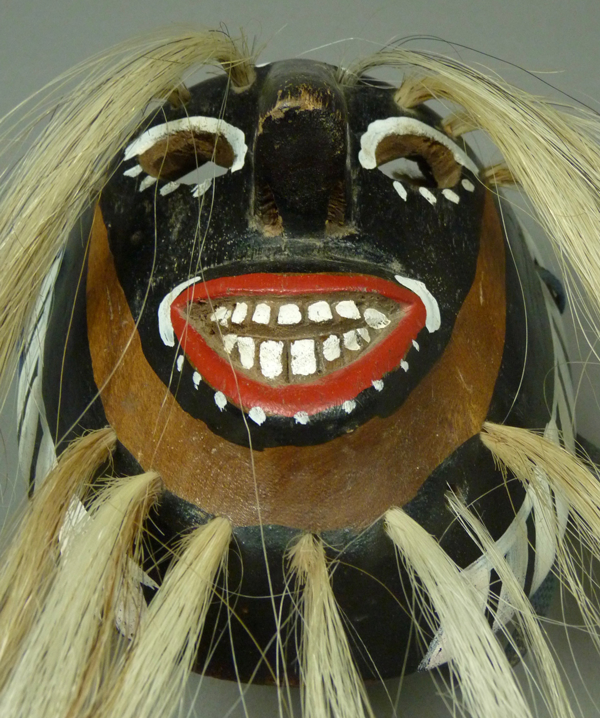 Why is this man smiling? 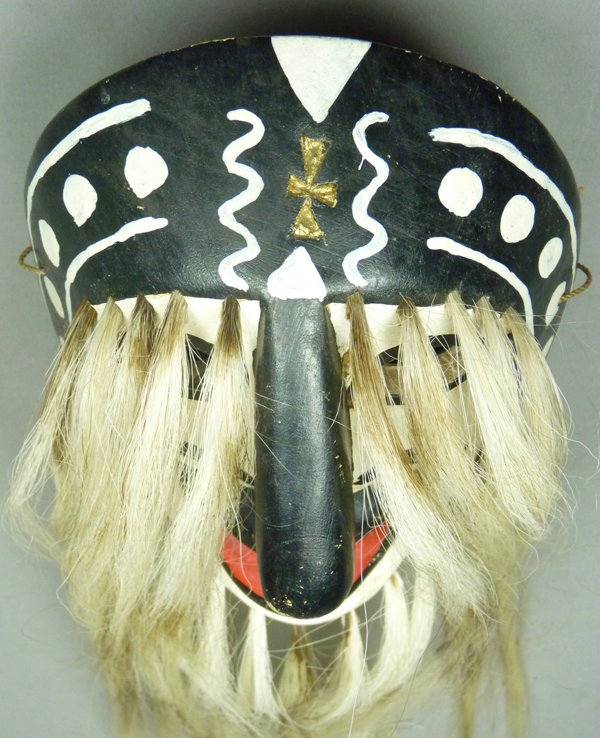 Because he represents what anthropologists call a sacred clown, a ritual figure who has both overt and hidden purposes. The simple forehead cross has such beauty and power. 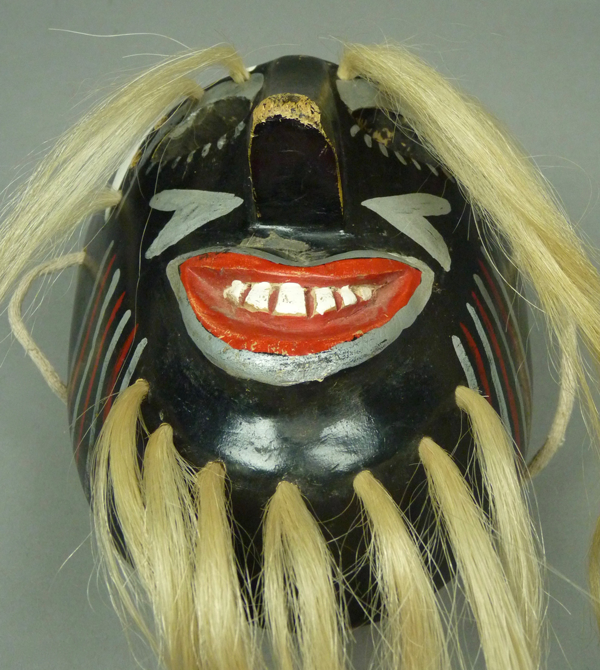 This mask is 7 inches tall, 5½ inches wide, and 3½ inches deep. The beautiful amber color of this back is testimony to serious ritual work over a period of years. 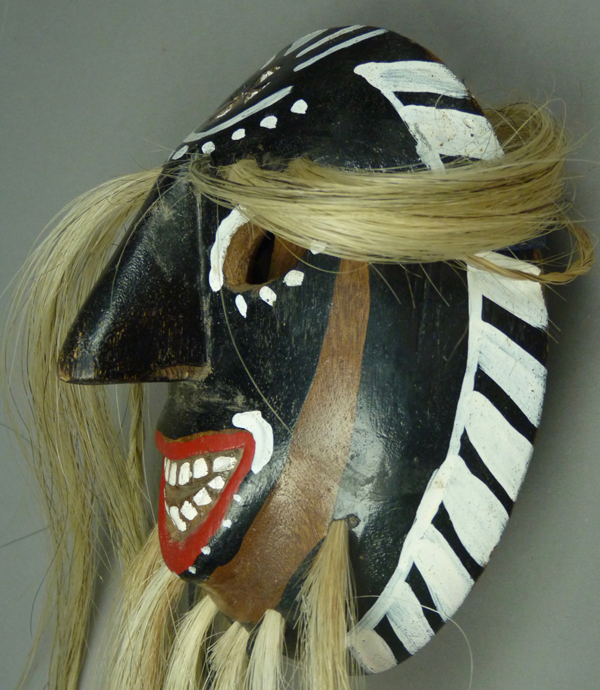 I have lost whatever documentation that I had for the last mask. The darkly stained back suggests that it has been as heavily danced as the other three, but the style demonstrates the innovations of recent decades. 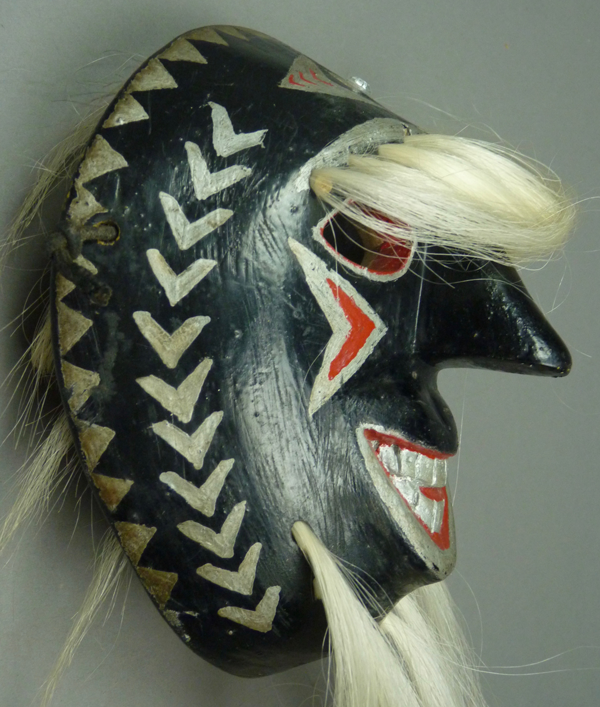 The mouth and the forehead cross on this mask are its most consistent Gámez features. The upper lip is particularly wonderful. 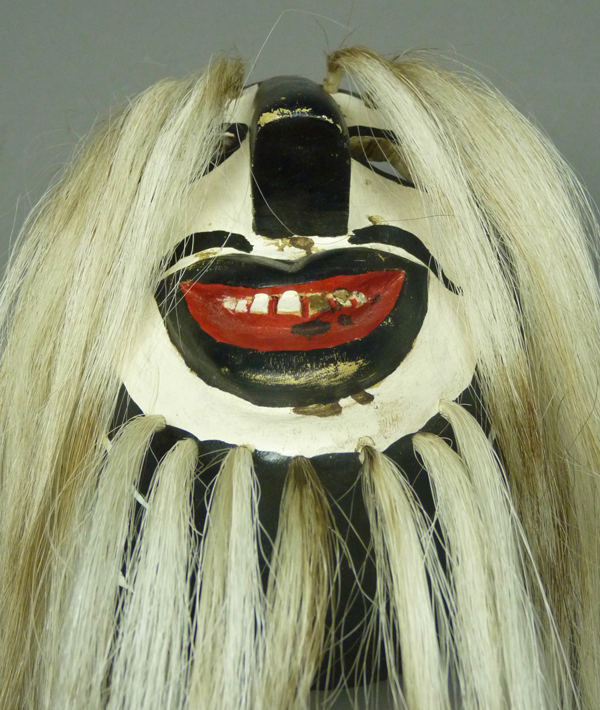 When the mask was repainted some paint sullied the hair of the beard. 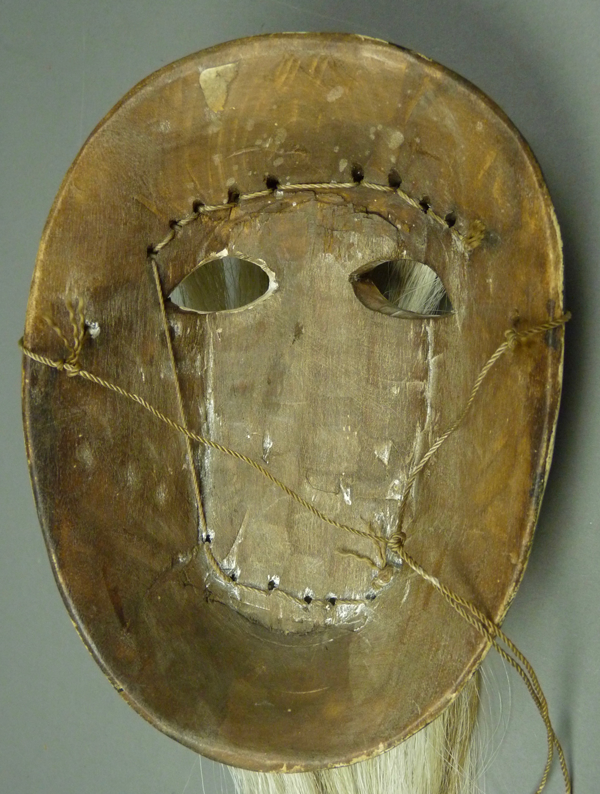 The rim design of white circles is unusual for Francisco, and causes the mask to look so modern. 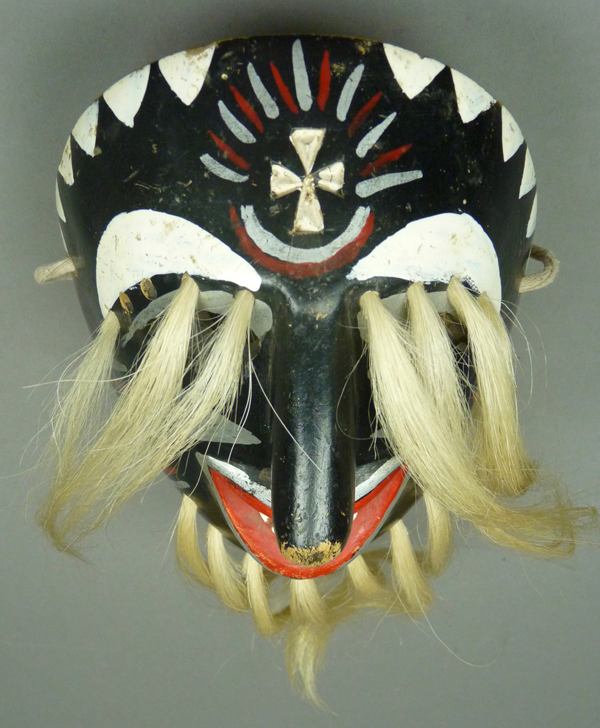 The nose is another element that reinforces the traditional appearance of this mask. There is some tension here between tradition and innovation. 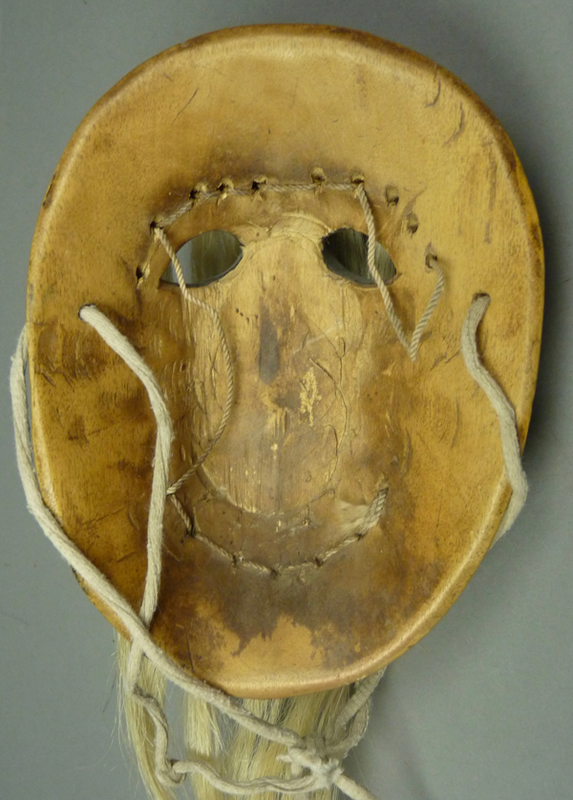 Here is the dark back of another well-loved mask. 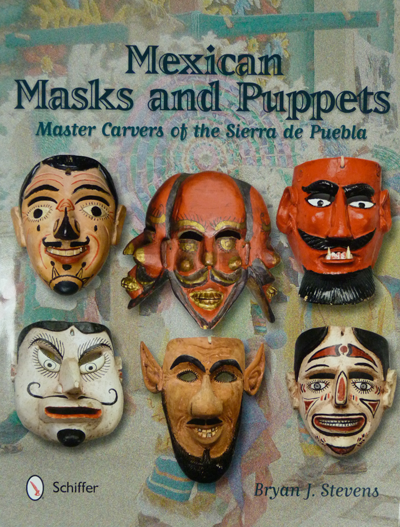 Next week we will examine additional masks by Francisco Gámez, masks that seem more novel, colorful and experimental.